For a video about how viruses and gene therapy work, visit http://bit.ly/2qFfvUk. 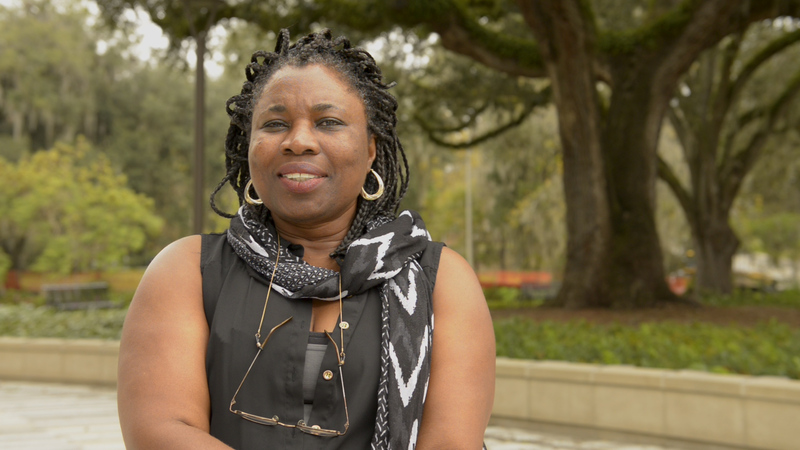 To learn more about UF Health researcher Mavis Agbandje-McKenna, Ph.D., go to http://bit.ly/2siexKV. For many patients, participating in gene therapy clinical trials isn’t an option because their immune system recognizes and fights the helpful virus used for treatment. Now, University of Florida Health and University of North Carolina researchers have found a solution that may allow it to evade the body’s normal immune response. The discovery, published May 29 in the Proceedings of the National Academy of Sciences, is a crucial step in averting the immune response that prevents many people from taking part in clinical trials for various disorders, said Mavis Agbandje-McKenna, Ph.D., a professor in the University of Florida College of Medicine department of biochemistry and molecular biology and director of the Center for Structural Biology. During gene therapy, engineered viruses are used to deliver new genes to a patient’s cells. While the recombinant adeno-associated virus, or AAV, is effective at delivering its genetic cargo, prior natural exposure to AAV results in antibodies in some people. As many as 70 percent of patients have pre-existing immunity that makes them ineligible for gene therapy clinical trials, Agbandje-McKenna said. The findings provide a road map for designing virus strains that can evade neutralizing antibodies, said Aravind Asokan, Ph.D., an associate professor in the department of genetics at the University of North Carolina, who led the study. At UF Health, the structural “footprints” where pre-existing antibodies interact with the virus were identified using cryo-electron microscope resources provided by the UF College of Medicine and the UF Office of Research’s Division of Sponsored Programs. The UNC researchers then evolved new viral protein shells. Using serum from mice, rhesus monkeys and humans, the researchers showed that the redesigned virus can slip past the immune system. “This is the blueprint for producing AAV strains that could help more patients become eligible for human gene therapy. Now we know how to do it,” Agbandje-McKenna said. While the findings prove that one variation of AAV can be evolved, further study in preclinical models is needed before the approach can be tested in humans. Next, the immune profile of one particularly promising virus variant will need to be evaluated in a larger number of human serum samples, and dose-finding studies are needed in certain animal models. Researchers may also need to study whether the same virus-manipulating technique can be used in a broader range of gene therapy viruses, Agbandje-McKenna said. Although human gene therapy remains an emerging field and has yet to reach patients on a wide scale, researchers elsewhere have used AAV therapy to successfully treat hemophilia, a blood-clotting disorder, in a small trial. It has also been or is now being studied as a way to treat hereditary blindness, certain immune deficiencies, neurological and metabolic disorders, and certain cancers. The latest findings are the result of more than 10 years of studying the interactions between viruses and antibodies and a long-standing collaboration with Asokan, who heads the synthetic virology group at the UNC Gene Therapy Center, according to Agbandje-McKenna. Grants from the National Institutes of Health supported the research.